A century ago, there were thousands of unique varieties of apples in the United States, but with the industrialization of our agriculture we have decided to only focus on a few varieties of apples. With the loss of biodiversity we have lost a lot of flavors, at least at the supermarket. The apple industry settled on a handful of varieties to promote and market. They became commercially extinct—but not quite biologically extinct. You can still find a good variety at the farmer's markets and your local orchards. One of my favorite fall traditions is to make apple butter. Virginia is blessed with a pretty good variety of apples, and every fall I cook some down into apple butter to get me through the winter. 6) Apple butter will keep in the refrigerator for a month, and you can also can or freeze some to enjoy throughout the year. Nothing says October like sausage and sauerkraut. 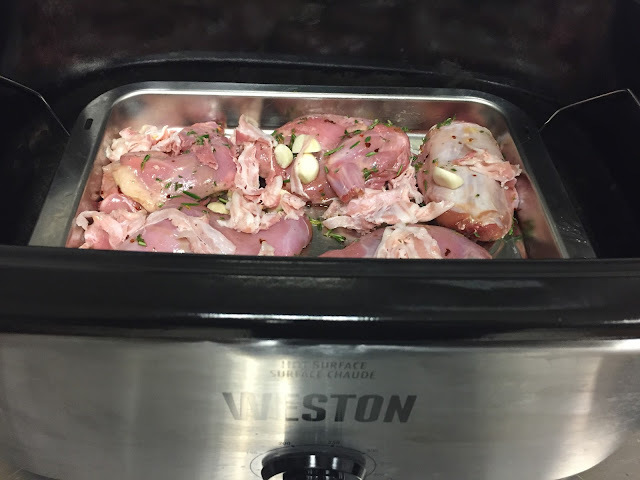 Weston has the gear to help you create your own Oktoberfest feast. From meat grinders and sausage stuffers to cabbage shredders and seasonings, we've got what you need to make an oktoberfest feast. 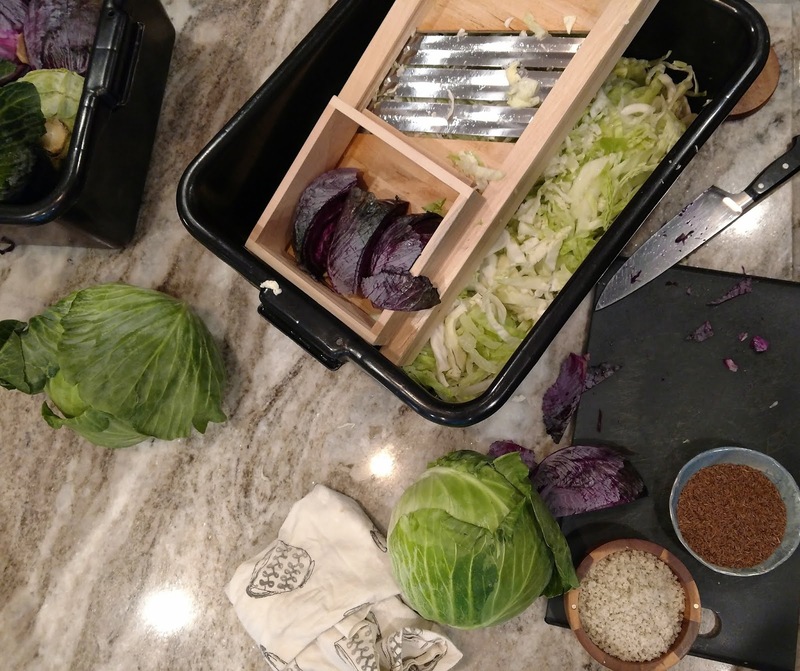 Shred cabbage using the Weston Cabbage Shredder into a meat lug or bus tub. Sprinkle with salt and massage into cabbage. Knead the cabbage, or pound with a rolling pin,until there enough liquid is generated to cover the cabbage. Stuff the cabbage into jars, pressing the cabbage underneath the liquid. If you need to, you can add a bit of water to completely cover the cabbage. 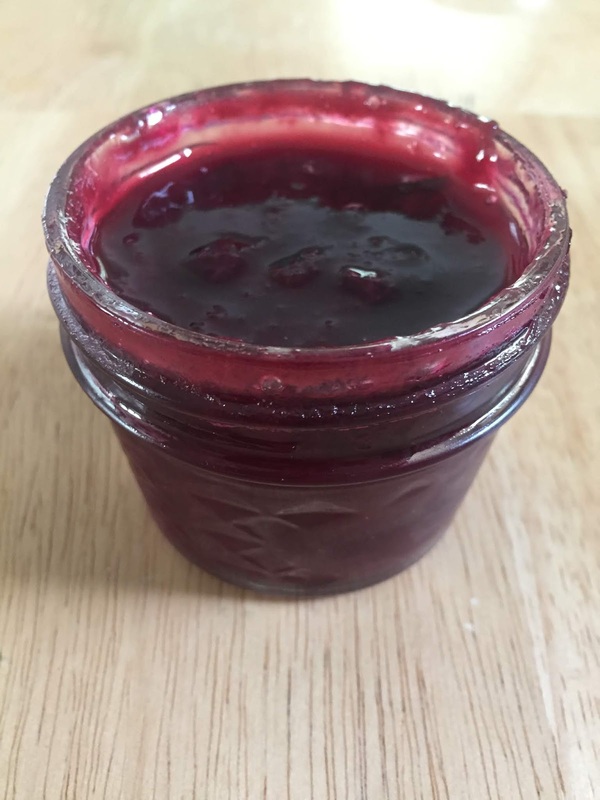 (You have some flexibility on the jars you decide to use- it can be a traditional canning jar, or one with an airlock lid, or even just covered with a towel. 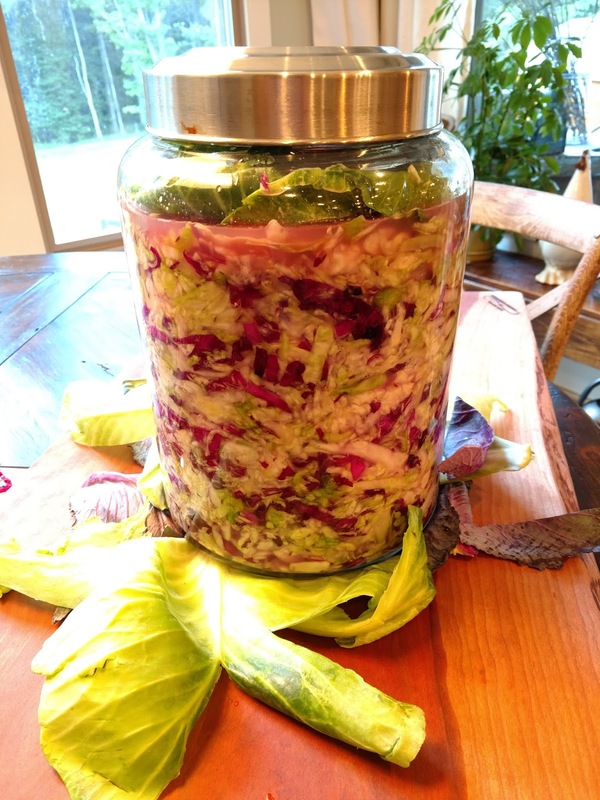 Once the sauerkraut is finished, put a tight lid on the jar and move refrigerator to store. The flavor will continue to develop as it ages but the fermentation lessens with cooler temperatures. Damson plums bring me back to my grandmother's house where I used to pick them and help make preserves. These small slightly sour plums are hard to find these days but make for a special treat! First, sanitize your jars by hand washing, boiling for 10 minutes, then keeping them in the hot water until you're ready to use them. 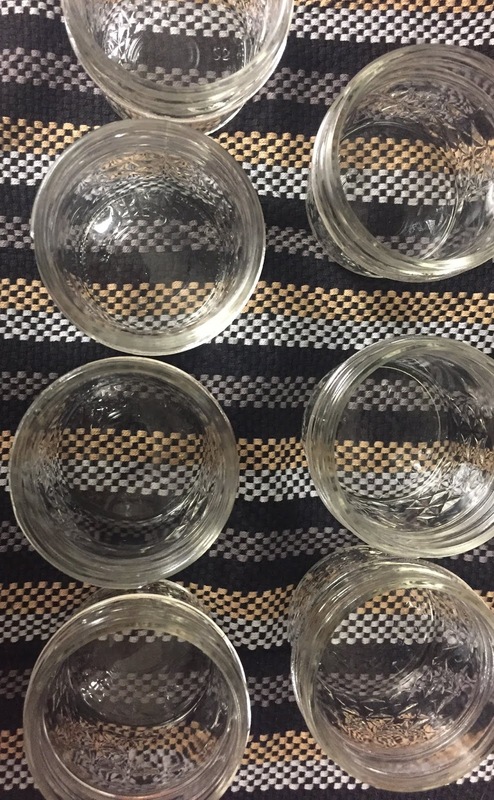 Repeat for the lids, but keep them in hot, not boiling, water. 4. Add sugar and boil for about 20 minutes until consistemcy becomes thick and "jammy"
Quickly remove jars from the hot water with the Weston® Canning Tongs. Pour the jam into the jars. Using a Weston® Magnetic Lid Lifter, remove a lid and ring from the hot water and place over the jar. Secure the ring with a Weston® Jar Wrench. Using the Weston® Jar Lifter, drop the jam-filled jars into the boiling water, making sure that they are completely surrounded by water. A canning rack helps to keep the jars off of the bottom of the canning pot so that the boiling water can reach the bottom of the jar as well. After five minutes, check the lids to make sure they're sealed (the button on the lid will be popped down), and if so, remove the jars from the water with the Jar Lifter. Let the jars cool, remove the securing ring, and store your jam in a cool, dark, dry place for up to a year (like you can wait that long). Memorial Day kicks off the summer season with cook outs and grilling and the search for the perfect side salad. 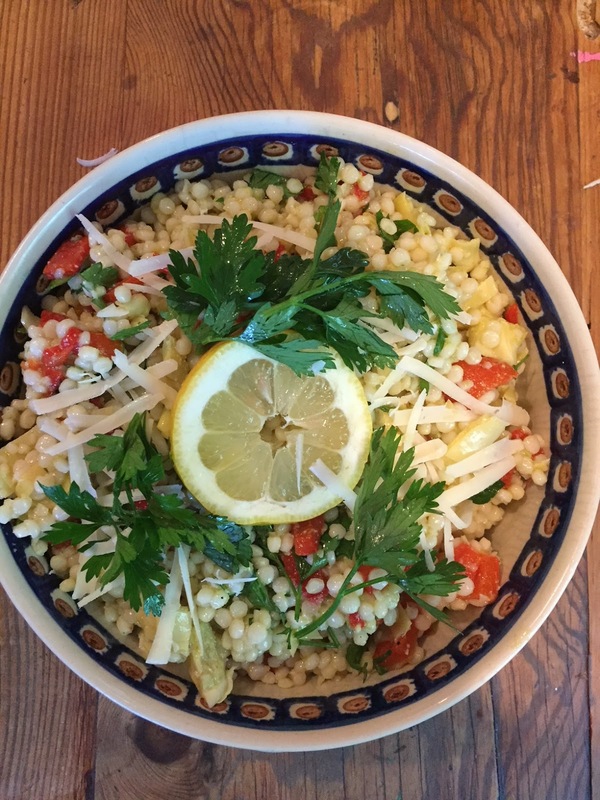 Instead of cole slaw and potato salad, try this new salad using Israeli cous cous and scape pesto. Cook 2 c of couscous in boiling water until tender , Drain and reserve. Combine cous cous and remaining ingredients in large bowl. This recipe has been adapted from a January 2009 Gourmet recipe by Toni Oltrani. 2. Toss chicken with oil, thyme, rosemary, sea salt, red-pepper flakes, and 1 teaspoon pepper, rubbing mixture into chicken. Arrange rabbit pieces, skin side up, in 1 layer in a 17-by 11-inch 4-sided sheet pan. Scatter garlic and pancetta on top and roast until rabbit begins to brown, about 20 minutes. Drizzle wine over rabbit and roast 8 minutes more. Scatter olives over rasbbit and roast until skin is golden brown and rabbit is cooked through, 15 to 20 minutes more. Let stand 10 minutes. 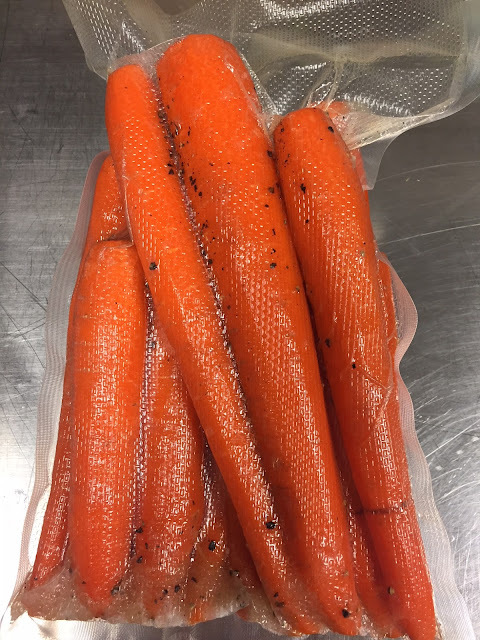 What better accompaniment to rabbit than carrots... here is a wonderful recipe for sous vide cooking carrots using Weston's new immersion sous vide. 1. Preheat sous vide to 183°F. Place carrots, butter, sugar, and 1/2 teaspoon kosher salt in a vacuum bag and seal according to manufacturer's instructions. Cook carrots in the water bath until fully tender, about 1 hour. At this point, carrots can be stored in refrigerator for up to 1 week. 2. Empty entire contents of bag into a 12-inch, heavy-bottomed skillet and cook over high heat, stirring constantly, until liquid has reduced to a shiny glaze, about 2 minutes. 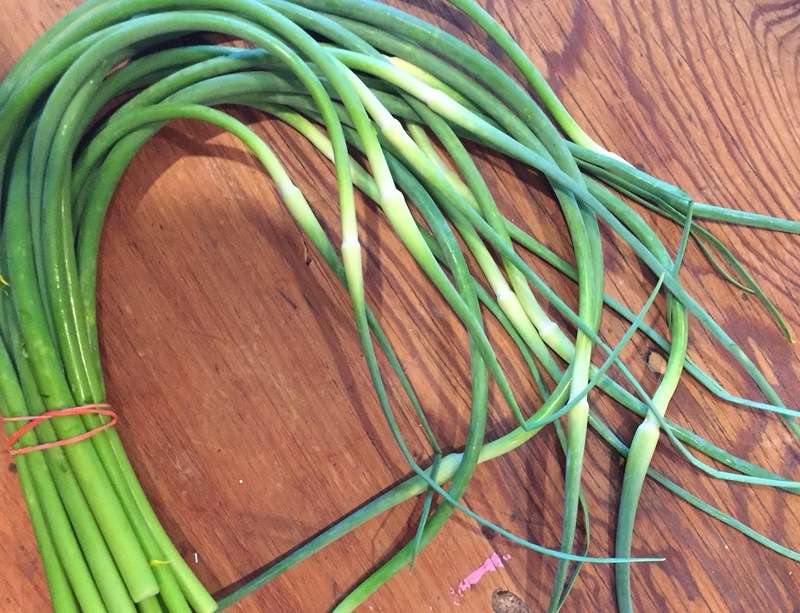 Season to taste with salt and pepper, stir in parsley or dill, and serve. outdoor skills that every hunter should know." Watch Steve walk through the process in this video. 4-20 pounds of whole muscle venison (or any other horned or antered animal) Weston jerky seasoning mix Methods: Before slicing the meat, place it in the freezer for a couple of hours. You want it icy and firm, but not so frozen that a knife can’t easily pass through. This helps you get perfect slices and saves you a lot of aggravation. Slice the meat across the grain in slices that are 3/8-inch thick. The Weston Jerky Board does a great job keeping the slices uniform. If the meat starts to thaw, pop it back into the freezer. Lay the meat out on the dehydrator trays, leaving space between the slices. Set the dehydrator to 145°F. Depending on the idiosyncrasies of your climate and dehydrator, it will probably take between 2 to 4 hours to finish the job. Start checking the meat at 2 hours and remove pieces as they finish. They should be firm throughout, with no sponginess. They will not break when you bend them. Rather, the fold will reveal a network of thin white lines. Peas, along with asparagus and ramps, are a few of the best parts of Spring. When Spring sprung last week, much of the country was experiencing snow, so I decided to hold off on publishing this out of respect to those not experiencing Spring weather. A lot of folks are intimidated by making their own sausage, but with the right equipment and a little practice, it can be the newest skill for your cooking toolkit. MeatEater's Steve Rinella walks you through the steps to make your own Sweet Italian Sausage. Place the cubed fat on a large plate or baking sheet in your freezer until it begins to harden, but don’t let it freeze all the way through. Put the cubed meat in your fridge to cool it off. You want everything nice and cold so that it’s on the verge of painful to handle it. Meanwhile, set up your meat grinder according to the manufacturer’s instructions and soak the natural hog casings (if using) in lukewarm water. Once the casings are pliable, change the water and give them another soak for 20 – 30 minutes. Then fit one end of each casing over the kitchen faucet and run a cup or two of water into the casing. Push the water all the way through, to rinse the inside of the casing. Set aside in clean water until ready to use. Combine the chilled cubed meat and pork fat with the Weston seasoning mix (1 Tbl/1 lb of meat). Mix thoroughly by hand for two minutes. Fill a tub with ice and place the bowl of meat inside the tub to keep it cool. Using the coarse grinder plate, grind the meat mixture into another bowl that’s set over ice. Change the die to the fine grinder plate and grind again. (This will create a finely ground fresh sausage. 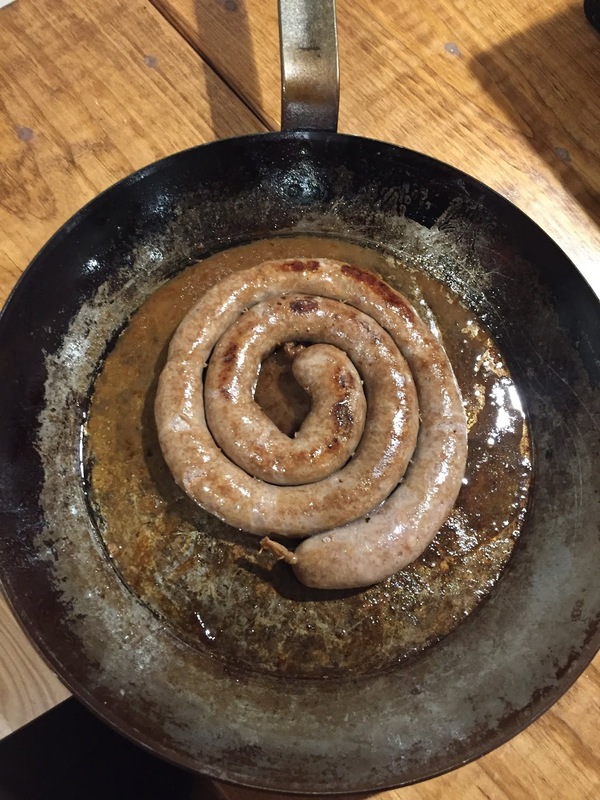 If you like a little more texture to your sausage, simply pass the meat twice through the coarse grinder instead of changing plates.) Cover and refrigerate while you set up your sausage stuffer. 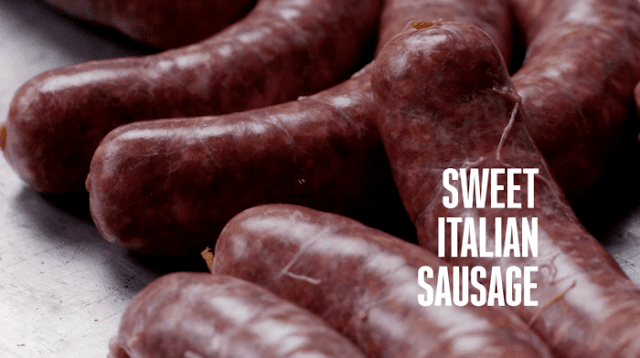 The sausage can also be stuffed into 1-pound poly bags as bulk sausage. Fill the hopper of your sausage stuffer with the sausage mixture, and fit the stuffer tube with a cleaned casing. 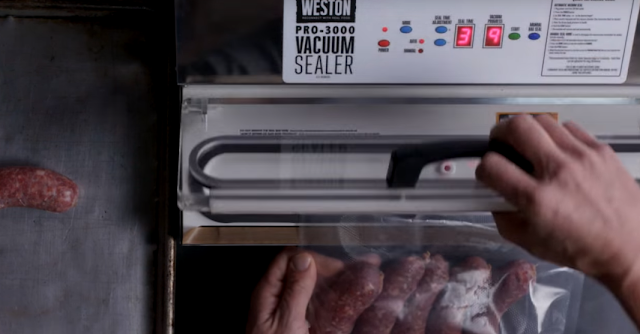 Start pushing meat through the stuffer to clear any air in the stuffer tube. Before meat enters the casing, tie the end with a simple granny knot. 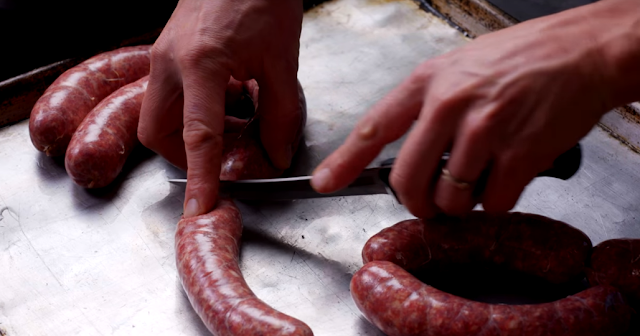 Working slowly, stuff the sausage into the casings. Be careful not to overstuff, and expel any large air bubbles inside the casing by pricking it with a sewing needle. When filled, tie off the casing with another granny knot. To create links: make two creases in the casing, one 5” from the end and another at 10” from the end. Twist the sausage at these two creases about eight times. Now you have two links. Make two more creases at 5” intervals and spin these. Continue down the length of the casing. To separate the individual links, gently pull the links apart and snip the middle of the “twist” with a pair of scissors or knife. 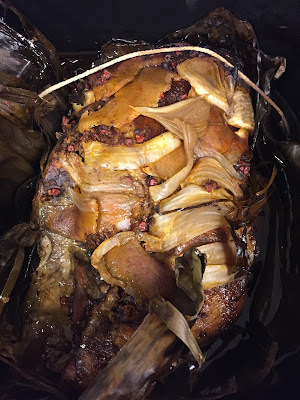 Traditonal Mayan cochinita pibil is cooked in earthen oven, but we've decided to try our roaster oven as a substitute. 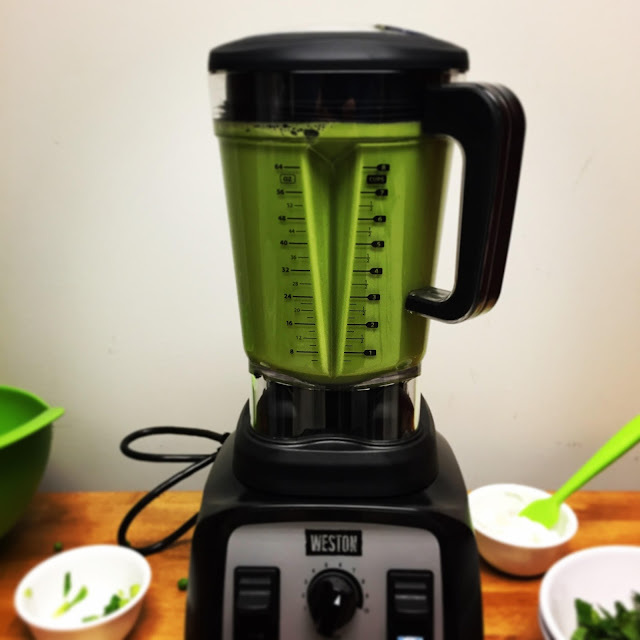 While we may not have met the earthiness of the traditional recipe, it still worked well. 1/4 cup Seville orange juice (bitter orange juice), or a blend of equal parts of orange, lime and grapefruit juices, plus 1/2 cup more for sauce. 1. Make the seasoning paste: In a small skillet over medium heat, toast the peppercorns, cumin seed, and allspice until fragrant, about 3 minutes. Cool then transfer to a spice grinder or mortar and pestle along with the annatto seed and grind into a powder. Annatto seed is hard and takes a bit of scraping down and repeated grindings to break up. Add the garlic, oregano, salt, and 3 tablespoons of the orange juice and process into a paste. 2. 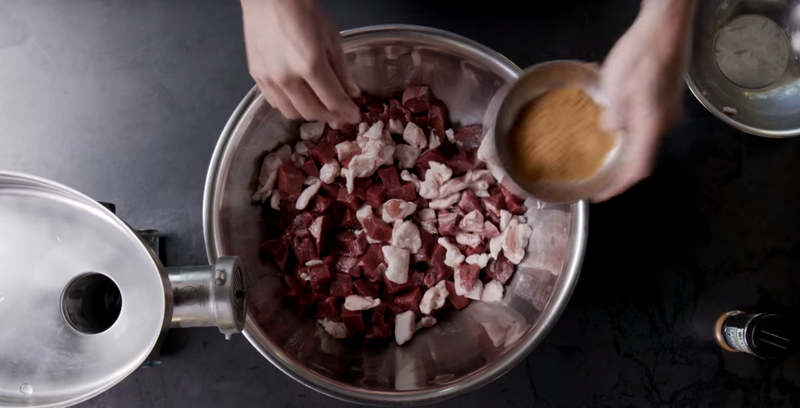 Make the pork: In a large bowl, rub the pork with the seasoning paste, a liberal amount of salt, and another 1/4 cup of the juice, taking care to rub the mixture into the folds of the meat. 3. Place some chopped onions and orange zest on top of banana leaves, place pork fat side down, and add onions and zest on top. 4. Fold over banana leaves, tie with twine, and turn over when placing in roasting oven so fat is on top. 5. Cook at 225 degrees for 16 hours. 6. Remove meat from leaves and shred with forks. The onions keep in the refrigerator for several days. 1. Combine all the ingredients in a medium bowl with enough water to cover the onions, and marinate for a couple of hours. 2. Serve at room temperature with the Yucatan pork, with refried beans, or on sandwiches.